The Gale surname was particularly prevalent in Surrey in the nineteenth century, although it occurs frequently in other Southern and South-western counties, with significant clusters in Lancashire and Yorkshire. The word itself seems to have a variety of origins: “jail” (Norman French; or a nickname for jolly or merry; or the Old French form of the Germanic Wale. Both Edward’s parents originally lived in the small village of Abinger Common a few miles south-west of Ranmore Common, His father Charles Frederick Gale was born on 16th October 1857. On various censuses he claims his birthplace was Abinger, but it seems to have been in Luton, Bedfordshire. 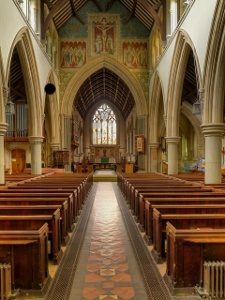 However, when he was baptised a year or so later, on 3rd June 1860, it was in St James Church Abinger, so that may explain his confusion. 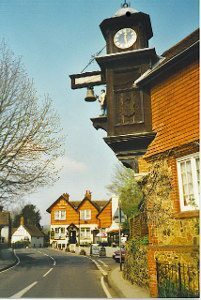 Charles Frederick’s mother was Rachel Gale, daughter of a charcoal burner, and her older brother Benjamin Gale kept the “Abinger Arms” in the village of Abinger Hammer. In 1861, young Charles Frederick is in Abinger Hammer. His mother Rachel is housemaid to the family of a Brighton stable livery-keeper, so Julia Ward nee Bristow aged 60 is looking after the three-year-old. Julia claims she is Charles Frederick’s grandmother, but it has been difficult to work out how this is the case, or whether she is no relation but employed to look after him. Anyway, she dies the following year, and by 1871 Charles Frederick is living with his widowed aunt, Rachel’s older sister Jane Longhurst, in the adjacent settlement of Abinger Common and working as a grocer’s errand boy. The following year Charles Frederick obtained a carpenter’s job at Denbies and subsequently was the Estate wheelwright. The family moved to Lonesome Cottage, on the western end of Ranmore Common, handy for the Estate’s woodyard (where the Scouts’ campsite now is). Charles and Henrietta stayed at Lonesome for a good few years. Along with their two younger sons, they subscribed to the 1903 Golden Anniversary scroll for Lord and Lady Ashcombe. In 1924, they returned to Abinger Common to live in Glebe Cottage, where Charles died in 1926. Henrietta Tilley was born in Abinger on 22nd May 1858 and baptised in St James Church on 25th July, In 1867 her mother Mary married William Thomas Belson in Croydon district and produced more daughters: Mary Eliza, born Abinger in 1868, and Caroline Emily. born Penge in 1870. Henrietta is probably the “Mrs Gale” in Lady Ashcombe’s Needlework Working Party in WW1. Her life followed the same pattern as her husband’s and, after he died in 1926, she stayed on in Glebe Cottage, Abinger Common, until her death in 1953. Edward Gale had only two surviving siblings, both boys. The gender of the fourth child who died is not known. 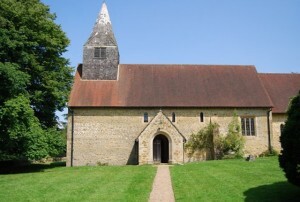 Edward’s older brother was born on 20th June 1882 and baptised on 23rd July at St James Abinger. 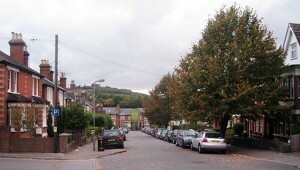 In 1891 he and the rest of his family are living with his widowed grandfather Benjamin Tilley in Abinger Bottom; George is at Abinger School where he reached Standard II. The following year the Gales moved to Ranmore Common and George started at St Barnabas School on 29th August 1892. 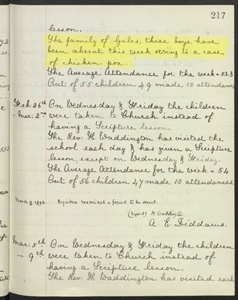 In February 1894 he features in the school logbook with his brothers when all three were kept out of school because of a case of chicken pox. George achieved Standard V before he “left for work” on 13th April 1896. By 1901, aged eighteen he seems to be still living with his family on Ranmore Common and working as a carpenter’s labourer, possibly assisting his wheelwright father. However, his name is not on the 1903 Golden Anniversary scroll, though his brothers’ names are, so perhaps by then he had moved away, probably into Dorking. In the 1910 Electoral Roll George Gale is in Dorking, lodging at 40 Church Street, right by St Martin’s Church. He is paying 12 shillings a week for board and lodging in a furnished room on the second floor. His landlords are mother and son Jane and James Brett. In 1911 George is still at No 40, now a fully qualified carpenter, his landlord James Brett being a railway porter. Also living in the house is James’ “sister” [actually his niece], Edith Annie Brett, born in 1887 at 6 Church Street Cottages and baptised at St Martin’s, the church at the end of the lane. Since she was brought up by his mother (Edith’s grandmother Jane Brett), James probably thought of Edith as his sister. George and Edith had at least one child, a daughter. From 1920 to 1924 they were still living with James Brett at No 1 Hart Gardens, Dorking. In 1925 they moved to a place of their own: No 9 Wathen Road (then in 1934 to No 139 Parkway, Dorking). George died there twenty-four years later on 7th February 1958. Edith Annie died the following year on 22nd July. Edward, of the War Memorial, fits in here in the family order. He was born on 31st October 1884, baptised 8th February 1885 in St James Abinger, and died on 27th April 1917. See his page for further details of his life and death. The youngest Gale son, Charles was born in Abinger on 11th February 1887, but only baptised 23rd May 1893 in St Barnabas Church after the family’s move to Ranmore Common. At the time his father was a carpenter, according to the baptism record, though later he became wheelwright on the Denbies Estate. Charles started at St Barnabas School 9th October 1892 , but there is little in the school logbook about his school career, except the whole family’s absence because of chicken pox in 1894, and that he gained a religious knowledge certificate in 1899 as a result of the Diocesan Inspection. In the 1901 census on 31st March he was still at school, living with his family in Lonesome Cottage. 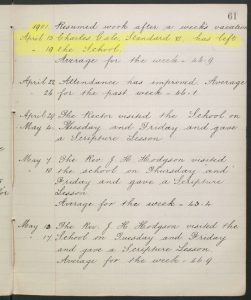 However, a mere fortnight later, on 15th April 1901, he “left school to go to work – Standard VI”. By 1911 Charles is still living at home and working as a shepherd. He would have been a suitable age to be in WW1, but cannot be positively identified from the scores of soldiers named “Charles Gale” in the Medal Rolls. Throughout the early 1920s he was at home on Ranmore with his parents and moved back to Abinger with them in 1924. He continued to live with his widowed mother in Glebe Cottage after his father died in 1926, He died in 1973. 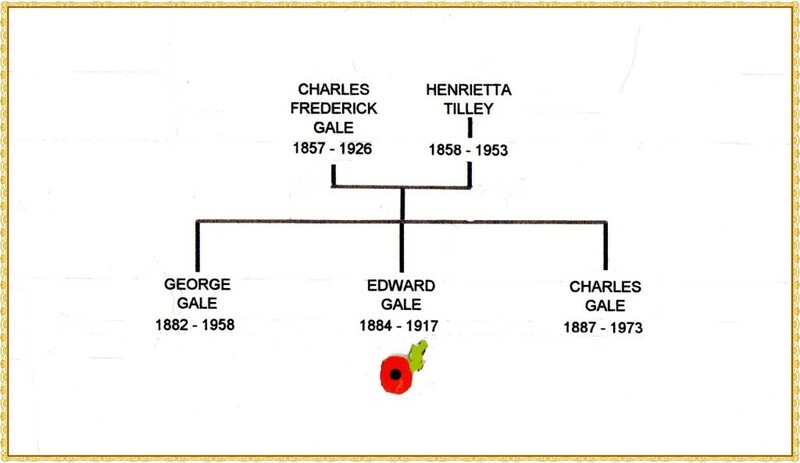 This is a composite list of the sources consulted for all members of Edward Gale’s family, but details for the individual family members are available if required. Virtually all of the sources mentioned can be viewed online via Ancestry, Find My Past and Free BMD.